Check This Out: Can You Cut Through The Entire Horror Film Alphabet? Earlier this year we highlighted a fun batch of posters crafted by artist Stephen Wildish who took each and every decade in film back to the 60's and assigned a film to each letter of the alphabet for each decade. However, since the illustrations were minimal, it wasn't so easy to figure out every film as it included everything from Austin Powers: International Man of Mystery to Zulu and plenty more films in between. 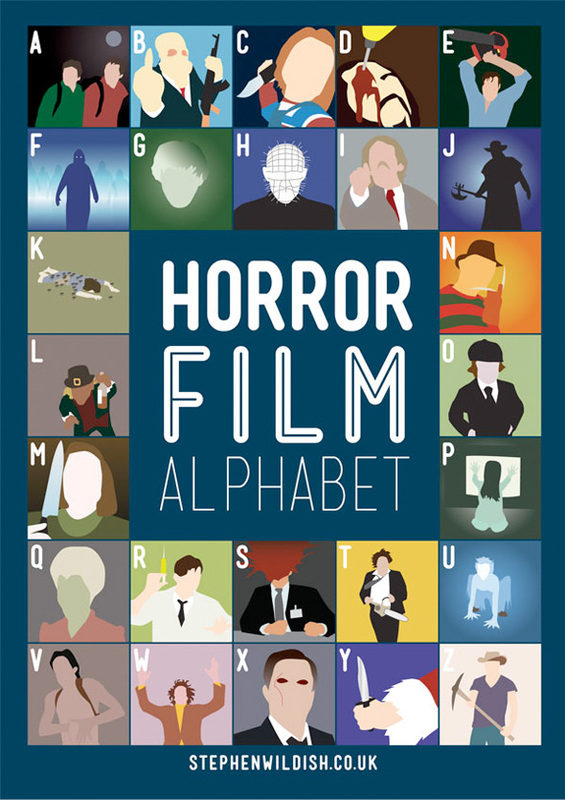 Now Wildish is at it again, but this time he's made The Horror Film Alphabet. Sure there's some easy ones, but I think you're going to be scouring the net trying to find all the answers this time around. Look! no Friday the 13th... fail. no Halloween? What kind of Horror movies are these? Damn, I would have never guessed The Ghoul & The Unnamable. I need to see those. Thanks man!